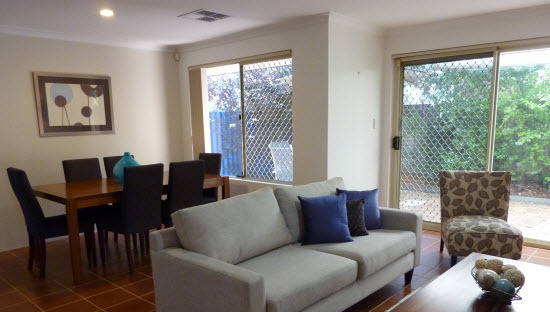 This property was lived in by the owners and they had not changed the colour of the walls since they moved in. Each room had intensive colours on the walls, which were overwhelming. The only room not to have colour was the master bedroom. Spruce Ups provided the hire furniture, however believed in the best interest of the clients investment in hire furniture, that they make a few minor changes. We believed that the client’s investment in the hire furniture would not be maximised with the current colour of the rooms and we provided this honest feedback to the client. In addition, as with all properties, there are weaknesses to the property that need to be understated and the strengths to be overstated. The living space became a beautiful bright area. It had a small pool in the court yard and would be well suited to a professional who worked in the city. The client engaged us to complete a Market Ready Inspection and colour consultation which provided them with specific recommendations that saved them money, maximised the value and minimise sale time. Living Area Makeover - Removed the dated yellow, repainted those walls only with a light feature colour, added hire furniture options that provides a modern home. Time to Complete - 2 weeks - client DIY our recommendations.